Our project provided cycling opportunities for young people all abilities but primarily for those with disabilities. The activities related to cycling using our specialised cycles, the young people were able to increase well being, make friends, gain confidence and increase self esteem. The peaceful, traffic-free environment at Cantray near Nairn enabled the young people and their carers if they so wished, the opportunity to enjoy a recreational activity in complete safety. The project benefited young people with disabilities and their carers. Activities related predominantly to cycling with our wide range of specialised cycles thereby promoting basic fitness and cycling skills, giving the young people opportunities to make friends, gain confidence and increase self esteem. All this accrued directly to the carer by improving the enjoyment, and relaxation of the young people, in turn allowing the carer to benefit from the improved quality of life of their charge, allowing them to get a break to pursue their own interests by participating in a family activity or being able to undertake other things, with the assurance that the child in their care was being responsibly looked after. The activities took place mainly at the Centre every weekday and on selected Saturdays. We also delivered an Outreach service to other rural areas across Highland and Aberdeenshire. As well as delivering sessions to our regulars and transient visitors, other user groups included: SOAR Invergordon, Enable Scotland (Caithness Branch), Reach 4 Reality, Galaxy Group, Go Dynamix, Cairngorm, Sport4All and Adventures Unlimited Scotland. Using the adapted cycles was not only beneficial in terms of improving health and wellbeing but also in terms of improving levels of independence which the young people could then transfer into other parts of their lives. The project exceeded our expectations with regards to the number of service users and carers enjoying the benefits of cycling. Word of mouth referrals proved particularly effective in enhancing the reputation of the Centre. Physical activities for those with disabilities are limited. Our project has reinforced the need for a 'tailor-made' environment where service users and their carers can reap the health and wellbeing benefits of cycling by undertaking a shared activity irrespective of ability. Our project has provided the opportunities to strengthen our links with other organisations that cater for people with disabilities. This has led to repeat bookings, particularly in holiday periods, as well as new group bookings scheduled for 2018 through our enhanced reputation. Opportunities to take cycling to remote areas were grasped. In particular, if young people and their carers had travelled from outwith the area to visit the Centre then the offer was always made to deliver Outreach sessions in a more convenient location. This led to sessions being delivered in Ellon and Glenmore Forest with further sessions being delivered in Ellon in Spring 2018 and Huntly in Aug 2018. At least 35 young people will have improved health and wellbeing through the use of our adapted cycles. 68 young people enjoyed cycling on our specialised cycles. As well as our regulars, we also provided opportunities to several groups, opportunities that many people with disabilities find difficult to access. The fact that people travelled from areas such as Caithness and Moray to get to the Centre is testament to the value placed upon finding the right activity in a safe and welcoming environment. Cairngorm Sport4All provide activities for young people with disabilities. Having visited the Centre in 2014 and 2015, arrangements were made to deliver an Outreach session at Glenmore Forest in May 2017 as the group were looking for activity options for their members, particularly activities that could be done locally as travelling was proving a barrier for some members. Despite the inclement weather, a hardy group of 3 young people and 4 carers enjoyed cycling on a variety of different adapted cycles around the peaceful trails of Glenmore Forest. The therapeutic value of course was tremendous as it allowed the kids to do what every other cyclist does. Furthermore, it was a fun, shared activity allowing memories to be formed for the young people and carers alike. At least 70 carers will improve their health and wellbeing either directly by enjoying ‘free time’ whilst service users cycle, Indirectly by enjoying fun cycling activities with the young people in a safe environment. 68 young people enjoyed cycling on our specialised cycles thus affording 126 carers the opportunity to share this activity or pursue other interests such as photography, filming, reading and shopping. At least 70 carers will have the choice to either, enjoy ‘free time’ whilst the young people enjoy fun cycling activities with others as a friend or family member rather than in the role of ‘carer’. K and E are teenage sisters. 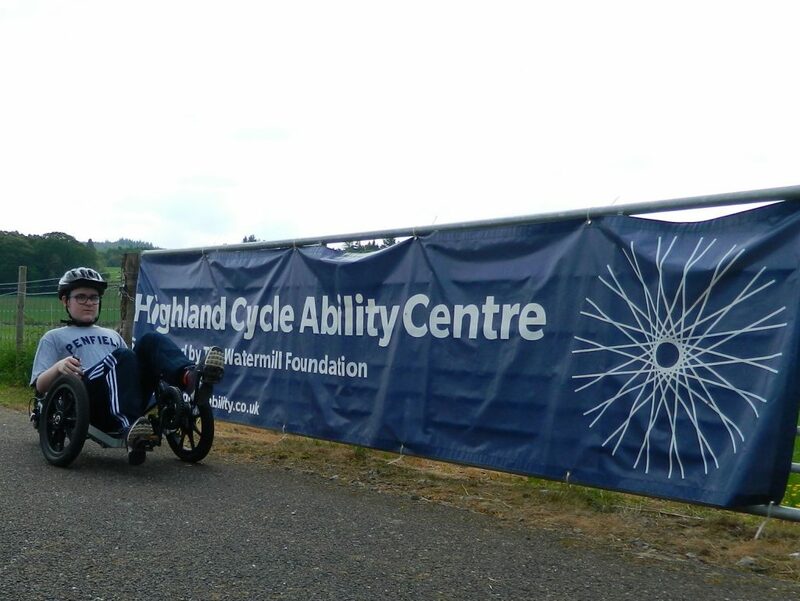 Both are autistic and regularly attended the Highland Cycle Ability Centre where they cycled together for up to 90 minutes on a Side-by-Side Quad whilst mum took the opportunity to cycle on a standard bicycle and, also, a recumbent trike. Dad would spend time taking photographs or relaxing. As their confidence grew, the family undertook a project to create a feature-length Christmas film starring both girls that was shown in 2 highland locations. Some scenes were shot at the Centre and the film included many cameo performances from people such as Nicola Sturgeon, Russ Abbott and the Centre manager! This was a fantastic effort from the family with mum publicly thanking the Centre and staff for participating in the project – a project that showed what can be achieved by people when given the opportunity and the right environment. 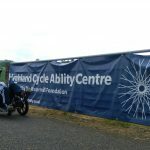 Carers continuing to trust the Highland Cycle Ability Centre’s provision of a safe and enjoyable cycling experience for young people with disabilities within their care. In turn this will lead to repeat visits and a timetable of activities throughout the week giving structure for the young people and parents/carers. The Centre welcomed repeat visits from groups such as SOAR Invergordon and Reach4Reality as well as being invited to deliver Outreach sessions in Ellon and Lewis as a result of word of mouth referrals. Furthermore, an additional 21 people visited regularly throughout the season with carers enjoying a break from the norm with many choosing to watch and, or, participate in a shared activity. At least 35 young people and 70 carers will improve their health and wellbeing through the use of our adapted cycles. A large bank of testimonials from the young people and carers highlighting the difference that short breaks have made to their daily lives. Throughout the season, there have been numerous examples of how being able to participate in a physical activity has benefited individuals and their support network. Centre staff have built up extremely good relationships with families and carers, often providing listening ears to carers as well as facilitating sessions for the young people.